Manderley Fine Furniture has been in the business of selling fine furniture for over twenty-five years. We favour both classic and iconic designs that stand the test of time. We promote the best in construction and materials that make furniture built today, a treasured antique for years to come. well beyond our initial contact. Having had our beginning in furniture refinishing, we know the value of supporting and teaching our customers how to care and maintain their valued items. If need arises, we are available to assist clients with expert repairs. We have two boutique locations on Mt Pleasant Road, in the heart of Toronto to showcase our many beautiful items. We provide a warm and inviting setting for viewing a lovely array of furniture styles selected for your perusal. We show an exciting variety of Stickley Furniture which is arguably the Finest furniture made today. Our highly knowledgeable staff is qualified to provide clients with insight into what makes a superior piece of furniture and how to incorporate it into an existing design scheme, or to begin with new design direction. We strive to make the selection of treasured furnishings for your home a unique and comfortable experience using our expertise to enhance your decisions about creating original and memorable space. is Mission, which is based on the Arts and Crafts movement. The Finger Lakes and Colonial Williamsburg lines are inspired by classic American furniture design. Stickley’s modern lines include Metropolitan and Edinburgh. From a small Condo to larger Home or Cottage, Manderley Fine Furniture can provide professional advice on colours, fabrics and furniture placement. 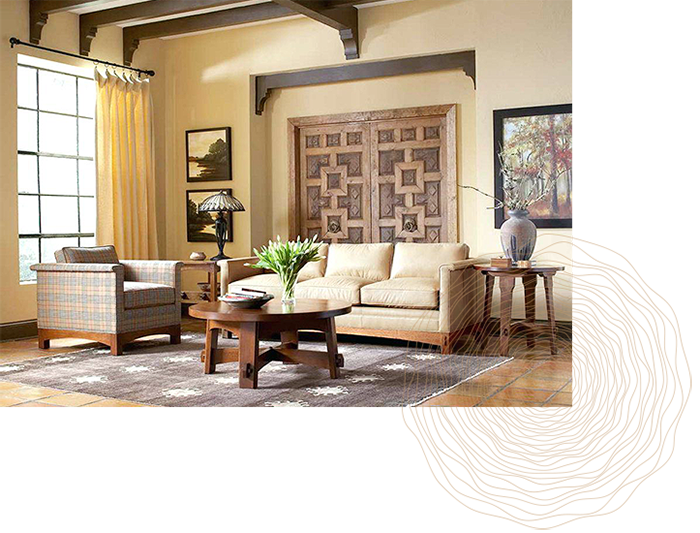 Stickley Furniture offers a diverse group of furnishings, from casual to highly sophisticated. Our goal, is to make your planning a little easier and more relaxing. All in-home consultations are reimbursed with a qualified purchase.